Sesame oil is one of the most frequently used massage oils in Ayurveda, the traditional healing system of India. 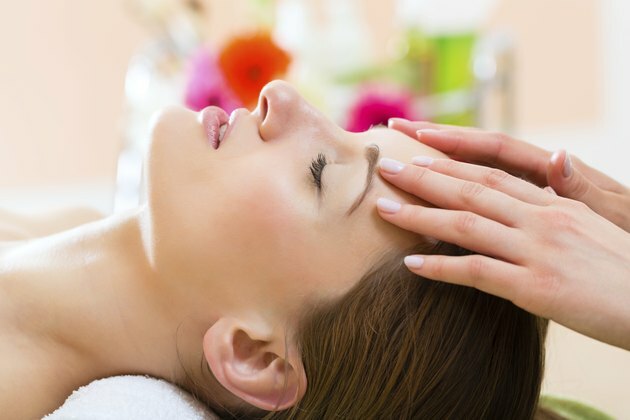 In fact, a pampering facial massage using oils, creates a smooth surface during the treatment so the therapist does not pull and stretch the skin. Massaging your face with sesame oil daily provides many benefits by helping rid the body of toxins, reducing the appearance of facial wrinkles and slowing down premature aging, reports the website DrOz.com. Within the Ayurvedic tradition, sesame oil is viewed as tridoshic, meaning it has benefits for all three doshas--vata, pitta and kapha. Doshas are similar to the concept of energetic forces and are factors in regulating health and disease, according to Associated Bodywork and Massage Professionals. Each individual has varying degrees of each dosha, some especially influenced by one or two, and some with a more balanced energy. Sesame oil has a special effect on vata, the dosha that usually needs attention. The pouring of warmed sesame oil infused with herbs onto the forehead for several minutes is called Shirodhara, as explained by "The Encyclopedia of Ayurvedic Massage". This therapy is traditionally used for nerve calming; releasing stored emotions; purifying the mind; and relieving fatigue, anxiety, nervousness and mental exhaustion. It may be performed after facial massage. Ayurveda medicine considers Shirodhara massage a psycho-spiritual treatment important for achieving higher states of consciousness. Sesame oil is beneficial as a carrier oil, also called base oil, for aromatherapy facial massage. Essential oils are very strong, and nearly all of them must be diluted with a carrier oil before applying to skin. Each carrier oil has a different group of properties providing specific therapeutic benefits. A sesame oil face massage provides the antioxidants vitamins A and E to facial skin. Antioxidants protect skin from cell damage that can be caused by free radicals. Sesame oil also provides protein to skin and is a moisturizer. Most people have no adverse reactions to sesame oil, and it is widely available and relatively inexpensive, as explained by Associated Bodywork and Massage Professionals. Sesame oil is a medium-weight oil, so it flows easily from the container at a rate appropriate for massage, including Shirodhara.